Elson, N., et al. Minimally Invasive Dentistry Approach Benefits of Using Laser. (2016) J Dent Oral Care 2(5): 1- 4. © 2016 Elson, N. This is an Open access article distributed under the terms of Creative Commons Attribution 4.0 International License. The preservation of healthy human body and function for every patient should be the goal of all health practitioners. Dentistry is not an exception to this philosophy. The loss of human tooth structure should be regarded as a serious injury and never to be considered lightly, therefore it is imperative to provide the most comprehensive and conservative care to all teeth. In past few decades, the improvements of scientific method and technology has led to a better understanding of oral micro flora and dental materials resulted in the shifting of caries management method from G.V. Black’s “Extension for prevention” to the modern “Minimally invasive” approach in dentistry. The minimally invasive approach to dental caries encompasses the science of detection, diagnosis and treatment on the microscopic level. The approach also establishes a proper doctor-patient relationship thus empowering and educating the patient to take responsibility for their own dental health. It has been widely accepted that the restorative materials and preparation designs are not the cure for caries. The dentist must recognize that the caries is a bacterial disease and the elimination of disease should be the priority before initiating any restorations. The proper sequence of caries management should be the introduction of preventive strategies such as oral hygiene instructions, remineralisation regiments, and risk assessments followed by minimal surgical interventions. Using the laser technology in the aspect of surgical intervention has many clinical advantages. Some of the clinical benefits include its selectivity for carious tissue, reduction of needs for local anaesthesia, decontamination effect of preparation surfaces, minimal thermal stimulus to pulp chamber, increase surface adhesion for composite materials, and other soft tissue applications. A critical evaluation of disadvantages on laser should also be considered when implementing its use in the clinical practice. The combination of caries prevention program, disease control, risk assessment and laser technology application on the surgical intervention significantly reduce the long term restorative needs thus preserve more healthy natural tooth structures, which complimenting the concept of minimally invasive dentistry. This presentation summarized various articles within the past 15 years regarding to topics of minimal invasive dentistry and laser technology usage in dentistry. Minimally invasive (intervention) approach are a new paradigm in health care dentistry as well accepts the same philosophy which include prevention, minimally intervention and minimally invasive restoration protocol. This approach applies not only for cariology but more and more implemented in other dental fields such as Endodontics, Periodontology, Oral surgery, Implantology. Minimally-invasive treatment in dentistry was presented the early 1970s with first introduction of diammine silver fluoride. Then development of Preventive Resin Restoration (PRP) in 1978 and the Atraumatic Restorative Treatment (ATR) in 1980 were introduced. This was followed by approach and chemo-mechanical caries removal concepts in the 1990s[1-3]. It is an evidence based approach and aim to do minimal harm to tissue. It based in individualized risk evaluation and early detection. Early diagnosis can set up the intervention for the arrest and remineralization of early noncavitated lesions. Individualized risk assessment benefits an individual’s risk of get a disease and predicts future risk through management of risk factors[4-7]. Based on MI understanding, tooth caries is considered to be a multifactor disease resulting in lesions of the tooth hard tissues[8-11]. Many studies have contributed to the development of the MID philosophy and change the dentists mind in caries prevention and treatment. We moved from G.V. Black “Extension for prevention” protocol to “Prevention of extension”. Dental plaque researches opened a new era in caries disease understanding. If caries is a disease we need to treat it as a disease. We as a health professionals need to implement total new strategies in educating patients. Dentists must engage and involve patients in the management of their disease. Therefore, all restorative procedures must be carried out only in conjunction with well understood preventive techniques and patient education. Team approach is very important: dentist, hygienist, patient. The preventive and restorative care, assessment of carious lesion development, diet evaluation and home care education are tremendously important in nowadays Dental Care. Application of sealants within the 6 months after tooth eruption can prevent further cutting of tooth structure. Using Digital Radiography and Laser Caries Detection Devise (Dexis) help diagnose caries on early stage and implement proper preventive program. The goal is to keep teeth healthy and functional for life. How can we achieve this goal in cariology? CAMBRA: Caries management by risk assessment is a guide to Radiographic, Recare and Saliva testing. 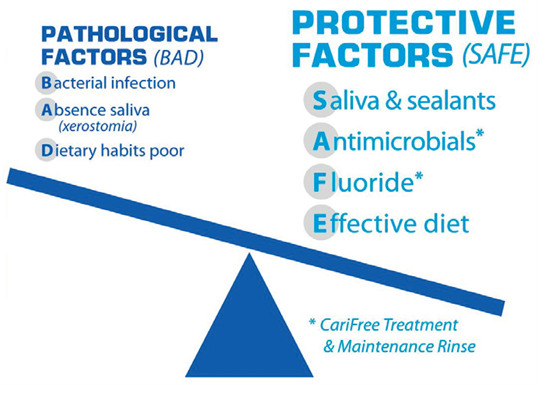 Based on risk factors for caries disease tests for oral bacteria followed by x-rays performed. Then disease indicators and risk factors would be evaluated. According to the finding patient would be put on different Caries risk level and prevention and treatment will be perform based on the conclusions. ICDAS: “The International Caries Detection and Assessment System (ICDAS) is a clinical scoring system for use in dental education, clinical practice, research, and epidemiology. The International Caries Detection and Assessment System (ICDAS) provides an evidence and preventive based protocol to visually detect and classify caries staging based on histological extent and activity”. There many remineralizing agents and various methods available in market: Casein Phosphopeptide-Amorphous Calcium Phosphate, Combination of CPP-ACP and fluoride, Novamin, TiF4 technology, Resin infiltration technology, Tri calcium phosphate, Nano hydroxyapatite, Enamelon, Ozone therapy. Minimal intervention techniques in cavity preparations also available: Chemomechanical, Air Abrasion, Piezo- and Ultrasonic instrumentation, Lasers. In the scope of this article we only discuss the benefits of using laser in MID. Laser cavity preparation: Erbium: yttriumaluminum garnet lasers (2,940 nm) and Erbium, chromium: yttrium-scandium-gallium-garnet (2,790 nm) and CO2 (9.3 - 10.6 nm) lasers are being used to cut dental hard tissues. Lasers can allow the dentist to remove caries selectively while maintaining healthy dentin and enamel. They also can be used without anaesthetic most of the time. Preparations are similar to those made with air abrasion; adhesive dental materials must be used for restoration[14,15]. No smear layer are produced that is why bonding agent should be selected accordingly. Advantages include no vibration, little noise, no smell and no numbness associated with anaesthesia. When dental lasers are used correctly, excessive heat generation and its harm full effects on dental pulp can be avoided. On the other hand training is mandatory and cost of the laser equipment is postponing the wide laser implementation in dental field. MID approach in endodontic procedures include: proper diagnosis, pulp tests utilization and caries risk protocol, minimally designed access opening, minimal removal of dentin, retention tooth structure during root canal instrumentation, utilize more crown lengthening procedure as opposed to tooth extraction and implant placement. If status of dental pulp allows the pulp protection procedure should be done as a definitive. Knowledge of tooth anatomy is crutial during the tooth structure removal. With excessive enlargement cervical root structure is at risk. Using Peezo and Gates Glidden deep into the canal should be avoided. Rotary instrument on the other hand should be used no larger than 06. Unnecessary root apex enlargement should be prevented. Better root canal cleaning and disinfection should be implemented. Laser has direct benefit to this matter. Gentle canal enlargement and proper disinfection could be done with laser. Proper precaution need to be taking in consideration when using laser in apex area. Post should be used when it is absolutely necessary and then strong, bonded core material is available for tooth structure enforcement. Occlusal adjustment play crucial role to avoid adverse functional forces. Since the early 1980s it has become evident that less invasive methods have produced far fewer complications with a reduced risk of death and morbidity. This treatment is minimizing the trauma of any interventional process but still achieve a satisfactory therapeutic result. Term MIPS is applied when we are talking about minimally invasive periodontal procedures. The use of microscope, periscope (magnification x 48) and microsurgical instruments are necessary in combination with proper regenerative materials. - minimize patient discomfort and side effects. - Some procedures may take longer than usual, compared with conventional surgeries. Laser therapy has the potential to be an effective, minimally invasive procedure in periodontal therapy. Use of the laser for gingival and bony recontouring has changed o the way periodontal surgery is performed. Different tipe of tips (end cutting and radially firing) can be used to reduce the tissue damage, kills the bacteria and gently recounter the bone. Using the YSGG with a tapered tip allows the operator to make scalloped gingivectomies with surgical precision and no bleeding. Erbium lasers with combination of Diode laser can be used postoperatively to reduce bleeding and pain. Lately laser show promising results in antimicrobial photodynamic therapy for nonsurgical and minimally invasive surgical treatment of periodontal pockets. These procedures are expected not only to control inflammation but also to provide bio stimulation effects with photonic energy. At present, systematic literature approaches suggest that more evidence-based studies need to be performed to support the integration of various laser therapies into the treatment of periodontal and peri-implant diseases. In implantology mini-implants versus standard-size dental implants might be used. Use of mini diameter implants is increasing, and more research publications and clinical technique articles about them are becoming available. The results of using mini-implants in terms of MID would be more patients who would be served successfully at reduced cost with minimized pain and trauma. Also flapless approach and computer guided surgery should be used when it is possible. In prosthodontics we are facing the dilemma because we need to cut the tooth. That is why is crucial what kind of restoration to use. In many cases, full crowns can be avoided in the treatment plan and replaced by veneer or composite restoration. Each onlay may preserve a large amount of tooth structure compared to a crown. Minimally invasive treatment options had more application due to the introduction a new adhesive technique in combination with restorative materials with translucent properties similar to those of natural teeth. Conventional cementation more and more replaced by a primarily defect-oriented method in prosthodontics. Resin- bonded FDPs and implants have made it possible to preserve the natural tooth structure of potential abutment teeth. Minimally Invasive Dentistry approach becoming standard of care in Modern Dentistry. Using excellent dental materials, new technology, and preventive protocol open a new horizon for our profession. Tooth structure preservation philosophy applies not only in caries treatment but in Endodontics and Periodontology. Patient centered approach dictates to perform dentistry by including Risk Assessment and patient education. Patient’s oral home care need to be adjusted after evaluation the medications and diet. Biological approach rather than mechanical allows having aesthetic and functional longevity, so that the teeth are not continually damages by retreatment. 1. Pitts, N.B., Ekstrand, K.R. International Caries Detection and Assessment System (ICDAS) and its International Caries Classification and Management System (ICCMS) - methods for staging of the caries process and enabling dentists to manage caries. (2013) Community Dent Oral Epidemiol 41(1): e41-e52. 2. Policy on Use of a Caries-risk Assessment Tool (CAT) for Infants, Children, and Adolescents, in Oral Health Policies. (2006) American Academy of Pediatric Dentistry 29-33. 3. Tyas, M.J., Anusavice, K.J., Frencken J.E., et al. Minimal intervention dentistry--a review. FDI Commission Project 1-97. (2000) Int Dent J 50(1): 1-12. 4. Barberia, E., Maroto, M., Arenas, M., et al. A clinical study of caries diagnosis with a laser fluorescence system. (2008) J Am Dent Assoc 139(5): 572-579. 5. Ekstrand, K.R., Zero D.T., Martignon S., et al. Lesion activity assessment. (2009) Monogr Oral Sci 21: 63-90. 6. Eggertsson, H., Ferreira-Zandona, A. Dentition and lesion history. (2009) Monogr Oral Sci 21: 102-112. 7. Jingarwar, M.M., Bajwa, N.K., Pathak, A. Minimal Intervention Dentistry – A New Frontier in Clinical Dentistry. (2014) J Clin Diagn Res 8(7): 4-8. 9. Ismail, A.I., Sohn, W., Tellez, M., et al. The International Caries Detection and Assessment System (ICDAS): an integrated system for measuring dental caries. (2007) Community Dent Oral Epidemiol 35(3): 170–178. 10. Featherstone, J.D., Domejean-Orliaguet, S., Jenson, L., et al. Caries Risk Assessment in Practice for Age 6 Through Adult. (2007) J Calif Dent Assoc 35(10): 703-707, 710-713. 11. Gutman, J.L. Minimally invasive dentistry (Endodontics). (2013) J Conserv Dent 16(4): 282–283. 12. Douglass, C.W., Valachovic, R.W., Wijesinha, A., et al. Clinical efficacy of dental radiography in the detection of dental caries and periodontal diseases. (1986) Oral Surg Oral Med Oral Pathol 62(3): p. 330-339. 13. Nasseh, A.A., Trope, M., West, J. Minimally Invasive Endodontics: Finding the Right Balance Between “Too Much” and “Not Enough”. (2016) Compendium 37(1). 14. Bader, C., Krejci, I. Indications and limitations of Er: YAG laser applications in dentistry. (2006) Am J Dent 19(3):178-186. 15. Olivi, G., Genovese, M.D. Laser restorative dentistry in children and adolescents. (2011) Eur Arch Paediatr Dent 12(2): 68-78. 16. Dannan, A. Minimally invasive periodontal therapy. (2011) J Indian Soc Periodontol 15(4): 338–343. 17. Cortellini, P. Minimally Invasive Surgical Techniques in Periodontal Regeneration. (2012) The J Evidence-Based Dental Practice 12(3): 89-100.